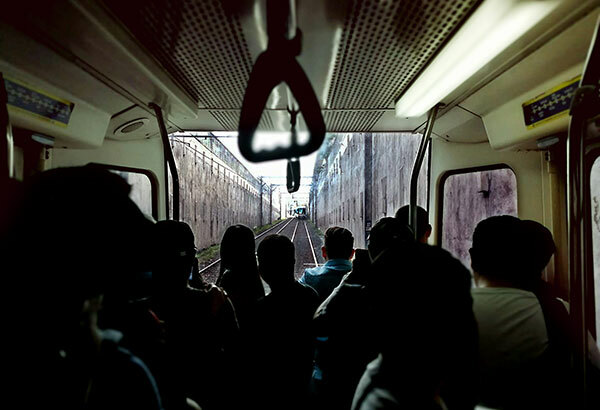 Image from Ivan Caballero Villegas’ Twitter account shows MRT passengers watching the main train unit moving forward as the coach they were riding was decoupled midway between the Ayala and Gil Puyat stations yesterday. MANILA, Philippines — Another day, another mishap for the Metro Rail Transit 3: train coaches detached from a northbound train in Makati City during yesterday morning’s rush hour, resulting in the unloading of over 100 commuters who were forced to walk to the next station. MRT operations director Michael Capati said it will take some time to determine the root of the problem, but they are now conducting an investigation. Capati said the detached train cars would remain at the MRT’s depot pending investigation. Cesar Chavez, undersecretary for railways of the Department of Transportation, said that a “messma card” from the detached train cars was missing based on initial investigation conducted by MRT’s technical team, which gave weight to the human intervention angle. The “messma card” is like a black box that records interventions in all trains of MRT-3. Chavez said they are now determining the persons responsible for removing the messma card and also their motives. Capati said they are not ruling out any possible angle that could have contributed to the detachment of the cars, including possible electrical and mechanical failures and human intervention. Contrary to Capati’s statement, Rowel Jose, rolling stocks specialist of MRT-3, pointed out that the incident had nothing to do with mechanical or electrical problems. “It only takes human intervention to detach the couplers,” he said. He explained that one can easily crank the lever to detach the coupler and if the problem was technical, all the couplers will be probed to determine why such incident happened. Ric Initorio, director for operations of MRT-3, said yesterday’s detachment of train’s coupler was not the first time it happened, as a similar incident occurred at GMA Kamuning station in Quezon City in 2011. Inotorio said the 2011 incident was because of an electrical problem, when a grounded wire was loosened up, causing the coupler motor to melt. Capati apologized for what happened and said the agency has prepared some measures to ensure the safety of commuters. Train operator Renato Año said that he was not aware that several cars had detached until he monitored “communication error” from the diagnostic panel of the train. He explained that a communication error appeared on the screen after a problem was not detected between the two cars, but he said he stopped immediately near the Buendia station after an operator of a southbound train radioed that some of his cars were detached. “While approaching Buendia station, I monitored on the side mirror that I had only two cars and I saw on the diagnostic panel a communication error,” Año said. Ivan Caballero Villegas, a call center employee in Makati City, said he and his workmate boarded a northbound train at the MRT Ayala station past 8 a.m. when they felt that the coach they were riding was detached from the rest of the train. Villegas said he saw the other coaches in front of their coach heading towards the Buendia station, leaving some coaches behind near the Ayala station. He said some commuters in the stalled coaches complained of the heat while others claimed they were suffocating as other passengers repeatedly pressed the lock button to open the doors. Before they were told to get off the detached car, Villegas said some angry commuters were cursing the MRT-3 while others called their offices to report their misfortune and delay in coming to work. A few minutes later, some MRT security guards arrived and instructed them to get off the train and walk on the rail tracks back to Ayala station. Some passengers complained that they should have waked towards Buendia station, which was closer to the detached coaches. Villegas asked the guards what happened, but nobody cared to give them an answer. A guard only told them that a “provisional operation” was implemented because of the incident. Upon reaching the Ayala station, most of the commuters queued for the refund of their single journey tickets, while Villegas rode a bus to get home to Malabon City. He also said that no emergency buses arrived at the Ayala station to assist the affected commuters. DOTr’s Chavez said around 130 to 140 MRT-3 commuters were “evacuated” by the security guards from both Buendia and Ayala stations. The MRT-3 is an attached agency of the DOTr. Chavez said that the detachment of the coaches prompted the MRT to limit service only the North Avenue station in Quezon City to Shaw Boulevard in Mandaluyong City. He said they temporarily stopped train service from Shaw Boulevard station to Taft Avenue in Pasay City to fix the problem and restore normal operations that were resumed at around 9:30 a.m.
MRT-3 management recently terminated its maintenance contract with service provider Busan Universal Rails Inc. (BURI) due to the firm’s alleged poor performance. But despite this, Chavez said the MRT-3 is now “improving” after the department took over the service maintenance from BURI. Sen. Grace Poe urged the Department of Transportation (DOTr) to suspend the operations of the MRT-3 if necessary in order to ensure the safety of its passengers. With the malfunctions still being reported regularly, Poe said that the DOTr should make a decision on the suspension of the operations of the MRT-3 if this is what it takes to address the problems plaguing the system. “What they need to do is to ensure the safety of passengers. Now if they need to suspend the operations, and we know there are around 500,000 who ride the train, but if we consider the lives that could be lost because of neglect, then maybe we should swallow this bitter pill,” Poe said. If the DOTr, which is now handling the maintenance of the MRT-3 temporarily, will push through with the suspension of the mass transit system’s operation, then Poe said that it should inform the public about how long this would last. She said that the DOTr should also have contingency measures in place in the event that the MRT-3 is shut down, such as providing more point-to-point buses for the commuters and maybe even giving them free rides.